Free ‘LIC Art Bus’ To Shuttle Visitors To Neighborhood Museums – Darnell TheNewsMan!! Socrates Sculpture Park will launch a free summer shuttle bus service to promote and connect Long Island City’s cultural institutions, while linking the Western Queens waterfront to a major transit hub at Court Square. 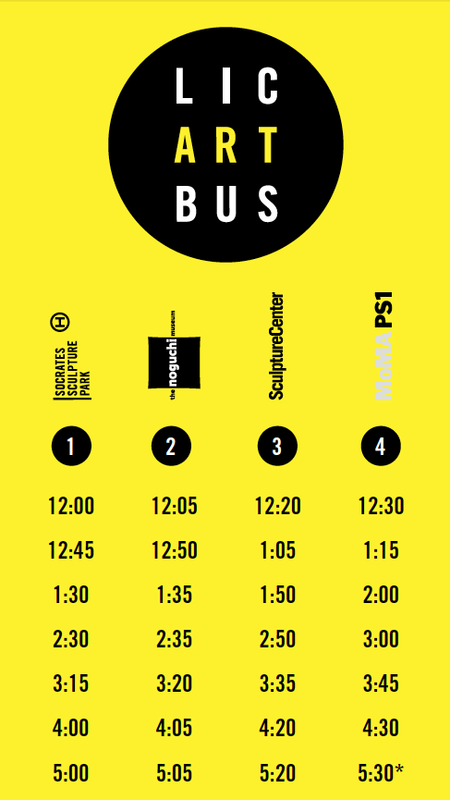 The LIC Art Bus will run on Saturday and Sunday afternoons starting May 10 through Sept. 14, starting at Socrates Sculpture Park and then stopping at The Noguchi Museum, Sculpture Center and MoMA PS1. The bus was started in part to address transportation issues affecting Long Island City, according to a statement, including several planned weekend service disruptions taking place this year on the local 7 train line. The MTA recently announced that it will begin testing out weekend service in June on the Q103 bus, which runs along the Queens waterfront and passes both institutions. For a full schedule and more information on the LIC Arts Bus, visit Socrates Sculpture Park’s website. Starbucks Half Price Happy Hour On Frappucinos! The New Amsterdam Market Returning To South Street Seaport!